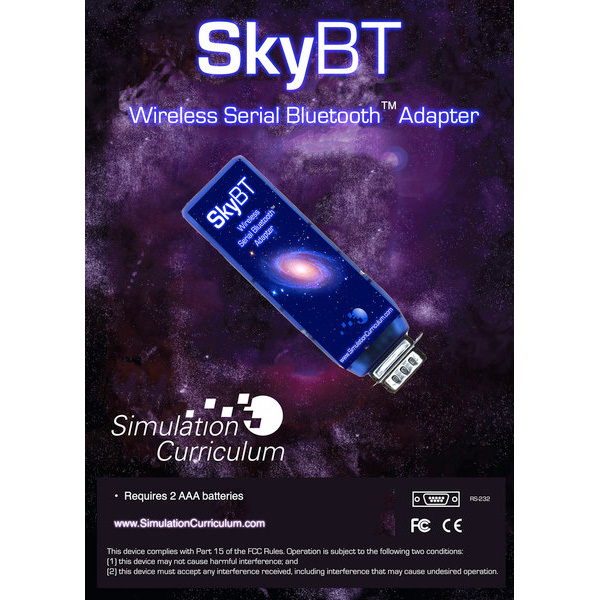 SkyBT is our NEW solution for wireless telescope control for use with SkySafari on Android devices! Smaller than a business card, it easily attaches to RS232 serial ports via a DB9 male connector. The device is completely Plug & Play. After pairing your Android device with SkyBT and tapping Connect in SkySafari, we automatically configure SkyBT with the proper settings for talking to your telescope mount. SkyBT runs off of two AAA batteries (alkaline or rechargeable) and has a built-in recharging circuit. You can expect to get 8-10 hours of scope control out of a set of fresh batteries. 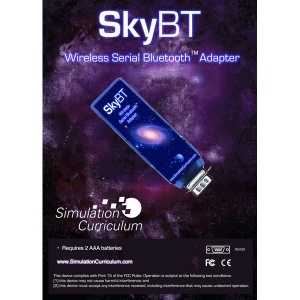 SkyBT is a Class 1 Bluetooth device with a typical range of around 100 meters, far more than cheaper bluetooth adapters. Note: SkyBT may also be used with our fantastic SkySafari OSX on an Apple Macintosh computer! Apple's iOS device users should opt for our SkyFi for purposes of telescope control as SkyBT is intended for Android only. Click here for the startup guide!